Can you show me your setup please? Hope this Photobucket image shows up for you. Its too big to upload here. 2 relays bottom left are for Torch on and 5 volt signal to disable steppers on an estop. The two on the DIN rail are push in units, the socket mounts to the DIN rail. Simple swap. those are not fully open contacts with the cover on them but there is likely very little current on the contacts. You might look and see if they are silver or gold contacts vs just copper. sphurley wrote: The two on the DIN rail are push in units, the socket mounts to the DIN rail. Simple swap. those are not fully open contacts with the cover on them but there is likely very little current on the contacts. You might look and see if they are silver or gold contacts vs just copper. Exactly, nice and simple relay setup but its not the OP's hardware. You need to visit the first post to see his. Cheers for that pic. It does look simple. What first post are you referring to? Are you referring to the manufacturers setup? Had my tech guy come an have a look at my setup. He couldn't find power to the relay on 1 of the modules. Went over it with a multi-meter and no numbers came up. Something that I did not mention is that the relay has an extra piece on it with a small screw which can be adjusted from the front (outside) of the controller box with the cover on. Not sure what this is for or if it has vibrated loose or not as I haven't adjusted the screw setting at all. Any suggestions? Will try and post a pic of it later today. Had another tech guy come around and check over my controller. He did find the problem. Turns out the controller board has a loose solder joint where the 2 main wires from the plasma machine connects to. It is cheaper to get a new board than repair the other 1. Have ordered a new board through ebay and will get my tech guy to install it. Until it gets here down under all I can do is wait. After almost 2 months of waiting I finally got my new controller board. Have spoken to my tech guy and have booked it in to get done on Monday. Hopefully will have my machine back up and running by Tuesday. Still have not yet got my machine running. I think it is a Mach 3 setup issue. My tech guy went with an external relay instead of going from the plasma through the 2 connections and back again. Instead of having 5 volts going through it, it now has 0.5 volts. Not sure if this changes anything in Mach 3 as I said but will keep going through and testing for a while yet before I change my tactics. I will post a pic soon to show the difference of before and after. Having issues staying logged in as I am trying to post pics but cannot do so as this stage. The top pic shows the plasma wire come in and go straight to the relay and then back to the board (2 pink wires) then goes to the power board then back out to the plasma. Before it went straight to the board then back to the plasma. Not sure if I need to change my Mach 3 settings as I also had to use a jumper previously to get the plasma to fire on the old board. Do I still need to do this as well? Here is a pic of my Mach 3 general settings/configuration page. Does it look ok or do I need to do some adjusting. Heard a small pop coming from the back of the controller and now I have the following happen. These are the light on my controller which are on when I first switch it on. Then when software on (Mach 3) page comes up. All above are off except power and Y dr. Still no x and y axis movement or plasma firing. Z axis still operating as normal. I have now replaced the new board with the old but have had the solder joints re soldered and it does the same. My tech guy is even unsure what is happening. Just thought I let you guys know what has been happening. I got my machine back from my tech guy and went to turn it on and as I got Mach 3 loaded in and pressed the red button the whole board blew up and now I have nothing working at all. Even the power board will not light up. I have also got the orange light on the plasma flashing as well so what is happening now I am unsure. Here is a pic. I have contacted my tech guy and he will come and look at it tonight. Got a new power board and also a new usb/parallel interface and now have got my x and y axis moving again. Just need to play with settings in mach 3 to get the plasma to fire. Will try that this weekend coming. Haven't posted in a while but here is an update. Still have not got my machine running with firing the torch. Still only have the x, y, and z axis moving only. Have now made the decision to take it back to the USA to my cnc guy who I bought the machine from. He has been so helpful so far and I can test the machine before I bring it home. I only need to take the controller box and my laptop. This is the last option I have as no one in my area can fix it. Will post when I get back. I am very lucky to have very understanding customers! 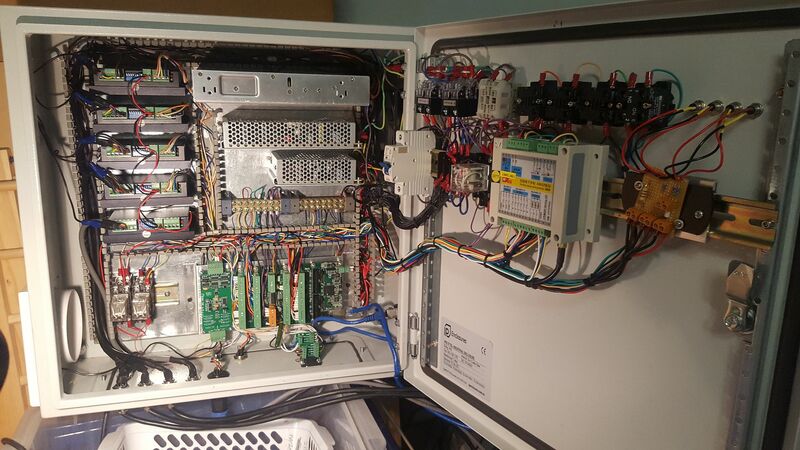 Just a heads up guys I have now had my cnc controller fixed by my cnc guy in the USA. I made the trip and tested it while I was here and now have the relay "clicking" like it should. Need to try it when I back home to Australia. It should be ok. I also got extra parts from my cnc guy while I was here in the US. Will post a video when I have it running soon. After 7 months of not having my table working I have now got it going. My cnc guy in the USA did his magic and now I can continue supplying my customers. I haven't posted a video but I didn't think I needed to. Thanks to all who offered help when I needed it. Well done, you have certainly had nightmare with all that!